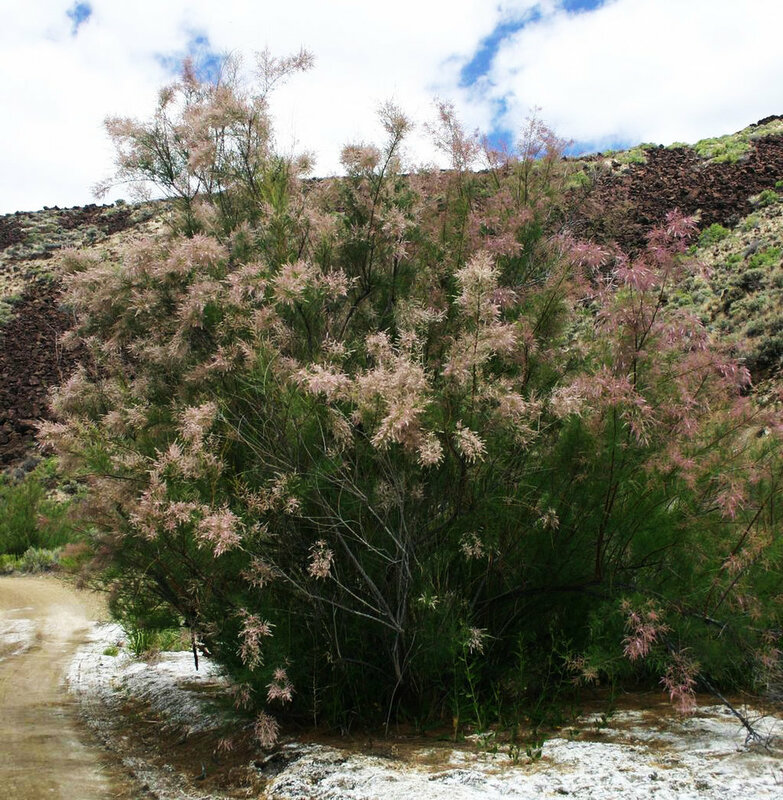 Reasons for concern: Tamarisk often grows in impenetrable thickets along waterways, especially those that are dammed upstream cutting off the natural spring floods that promote native tree populations and becoming a wildfire hazard. It holds salt in its tissues, so fallen leaves increase soil surface salinity making it difficult for native plants to establish. Native plant and bird species, such as the southwestern willow flycatcher and their related pollinators, have been displaced from native populations. Dense populations change water flow, widening floodplains by catching sediment and lowering water tables. It offers little food to wildlife. Dense stands support lower biodiversity than the native communities they displace. They have severely limited the number of germination sites that are suitable to cottonwood and other riparian species leading to a decline in native cottonwood populations. Botanical description: Small deciduous, dense, wispy, spreading, loosely-branched tree or shrub. Leaves: Needle-like leaves, similar to cedar or juniper tree. Stem(s): Usually 10 to 15 feet tall, sometimes taller. Can have multiple trunks. Highly branched. Branches smooth, hairless, reddish brown and appear jointed. Can grow many feet tall in one season. Flowers: Pinkish-white to pink petals in dense clusters of 2-inch long slender spikes. Abundant April through August. Where it grows: In the Western U.S. along streams and rivers, in some wetlands, along shore lines of reservoirs and ponds. Weedy characteristics: Re-sprouts after damage to the crown, stems, roots and root pieces. Robs other plants of water. In many places, their dense stands have replaced cottonwoods, willows, and other native riparian vegetation. Control strategies: Hand pull seedlings. After taproots are established, machines and chemicals may be effective. Research is being done on biological controls. USDA began introducing leaf-eating beetles (Diorhabda elongata) in 2007 to reduce populations. Beetles defoliate Tamarisk trees throughout the growing season. It can often take more than one year for shrubs to die. Fires don’t work, since this is a fire-adapted species and will re-grow after fire. Professional removal may be required. Only herbicides approved for use in aquatic environments should be used. Contact your local county extension office for more information on chemical control.